The SSTA Salaries and Conditions of Service Committee met on 28 January to consider developments in the 2018 Pay Negotiations. The SNCT Extended Joint Chairs (SSTA, EIS, COSLA and Government) met on Monday 28 January and COSLA (the employers) tabled an offer in line with the Deputy First Minister letter of 10 January 2019. 2018/19 – 3% pay increase for all SNCT grades will apply, up to a cap of £80,000. At or above this figure a flat rate increase of £1,600 will apply. This award will be back dated to 1 April 2018. 2019/20 – 3% increase will apply uniformly across all SNCT posts governed by the terms and conditions of the SNCT (no cap). 2020/21 – 3% pay increase will apply across all SNCT posts governed by the terms and conditions of the SNCT (no cap). restructure the Teachers Main Grade Scale to remove scale point one and add 3% to each of the remaining scale points from 1 January 2019. These changes will also mean a higher starting salary and faster progression for those coming into the profession. to revalue the salary scales for promoted posts and associated professionals will add 3% from 1 January 2019 to all relevant pay points. The COSLA pay offer letter and associated pay scales are included for your information. union side is insisting upon a re-opener clause as a requirement in any multi-year deal due to uncertainties (such as Brexit and increases in the retail price index). the union side is insisting, as a part of any deal, a major commitment from Government and COSLA to address excessive teacher workload and the challenges in supporting pupils with additional support needs. The Salaries and Conditions of Service Committee was committed to a Consultative Ballot of members should a new offer be forthcoming. 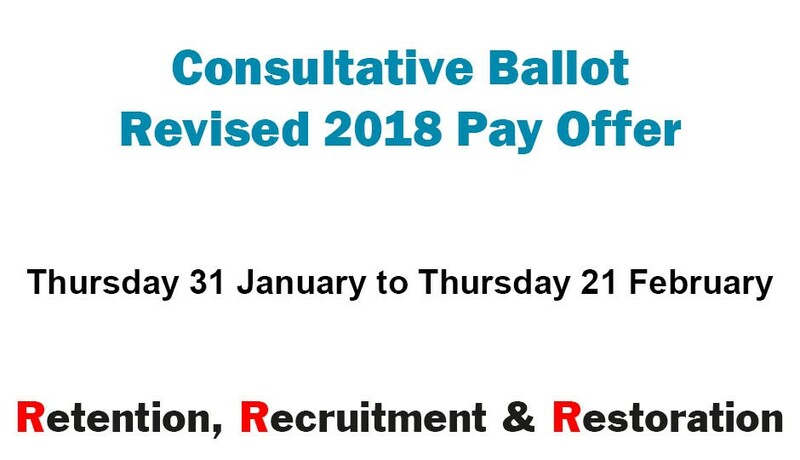 As the new offer has now been submitted the Consultative Ballot will commence on Thursday 31 January and will close at noon on Thursday 21 February. Please note only members employed by local authorities will be invited to participate in the consultative ballot. In the event of a rejection of the pay offer the Salaries and Conditions of Service Committee will move to a formal Ballot for Strike Action should the thresholds of the UK Government’s Trade Union Act be met.